January 20, 2012—Until we bought Baby, I had only been camping once in my life. I had been dating Dennis, a real outdoorsman, who loved hunting, fishing, and camping—tent camping. It must have been July or August. I was living in Indianapolis, and I put the kids on an airplane to visit their dad on the East Coast. Dennis and I planned a weekend getaway to the Hoosier National Forest in southern Indiana. He said he would take care of it all: He had the tent, fishing poles, stove, dishware, coolers, and sleeping bags. He also bought the food. All I had to worry about was packing a few clothes and my guitar. I wasn’t too sure about this adventure. I had never been camping before, and we were to be camping in a primitive area. There was an outhouse across from the campsite, but no showers. We would be washing in the lake. Dennis did take care of everything. Once we arrived at the campsite, he set up the tent lickety-split. And he cooked the evening meal. The only help I lent him was to show him how the sleeping bags could be zipped together. What I discovered during that weekend was that I liked camping as long as I didn’t have to do anything; primitive camping does nothing for your hairdo; and food does taste better cooked over an open fire. In other words, camping wasn’t out of the question for me, but it wasn’t high on my agenda, either. Now to the present: We have been “camping” in Baby off and on for about nine months. This type of camping is nothing compared to the tent camping I had done 35 years ago, especially when we are in an RV park where we have full hookups. Dry camping, on the other hand, is another story. I didn’t mind dry camping (also known as boondocking) while we were enroute from point A to point B. But I have to admit that I am not so fond of it here in the desert. To dry camp, you have to conserve energy resources—both electricity and water. During the day, our batteries charge up thanks to the solar panels on the roof of the motorhome. Since it is not too hot, we can open the windows and be comfortable. But, we cannot run too many appliances and we must watch how many lights we have on. In the evening, we turn on the generator. We can then watch TV, put on as many lights as we desire, and be comfortable. However, about 10 p.m. or11 p.m. it is time to shut off the generator. (In RV parks, generators are not permitted after 10 p.m., generally, because of the noise.) We are out in the middle of the desert, but we do have neighbors, and we try to be courteous, so we shut off the generator. Without the generator, we have no heat. (I guess we actually could turn on the propane furnace, but we don’t, since the blower would use electricity.) By morning, we are definitely cuddling under the warmth of our down comforter. The other morning it was 43 degrees outside; today, it was 47. It was so cold that both of the cats slept at our feet and enjoyed the warmth of the bed. 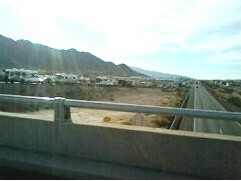 Neverending stream of RVs coming to Quartzsite. Another downside of dry camping is water conservation. Obviously, using our clothes washer/dryer is out. But aside from that, dry campers have to take very short “Navy” showers (wet down; soap up; rinse off). Purists save the water they bathe in and use it to flush the toilet. We haven’t gone that far, yet (and I hope we won’t). We’ve found creative ways to conserve water while washing the dishes and brushing teeth. Despite our conservation efforts, however, our gray water tank was filled this morning, and our water holding tank was almost empty. So, it was off to the place where we could dump the tanks and fill up on water. This, after only two days in the desert! No, I cannot say that I am fond of dry camping. But a lot of people must be. They just keep coming in here. We now have a lot of neighbors, with more expected as the week progresses. We’ll probably stick this out, although we always have the option to check into an RV park with full hookups. We’ll see.